21st-century problems can’t be solved in isolation. A liberal arts education at Rollins empowers students to make connections across multiple perspectives and to anticipate an increasingly global future. 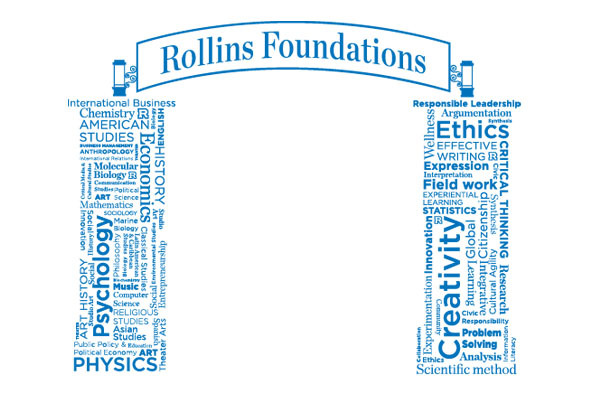 The pillars of a Rollins education: the focused study in a major and building competencies through Foundations courses. At Rollins, our mission is to educate students for global citizenship and responsible leadership. These qualities are forged in an intellectual community, in spaces where professors lead students to encounter new ways of thinking, to place things in context, and to construct a critical conversation through research and original analysis. Where a major will give students depth in a field, their foundations seminars demonstrate that the global problems of the day cannot be solved within a single frame. The Rollins students who will become responsible leaders in our world will bring an ability to make surprising connections and think across barriers. It’s no coincidence that the skills students develop in their foundations seminars are exactly what employers say they want from new hires —the skills to communicate, solve problems, and collaborate. That’s the second half of the mission: global citizenship and responsible leadership, meaningful lives and productive careers. The Foundations program prepares Rollins students to create innovating, thriving communities in the world.